$599 Dealer Closing Fee is included in the advertised price. Pre-Owned vehicle pricing includes all offers. Tax, Title and Tags not included in vehicle prices shown and must be paid by the purchaser. While great effort is made to ensure the accuracy of the information on this site, errors do occur so please verify information with a customer service rep. This is easily done by calling us at (843) 628-5538 or by visiting us at the dealership. 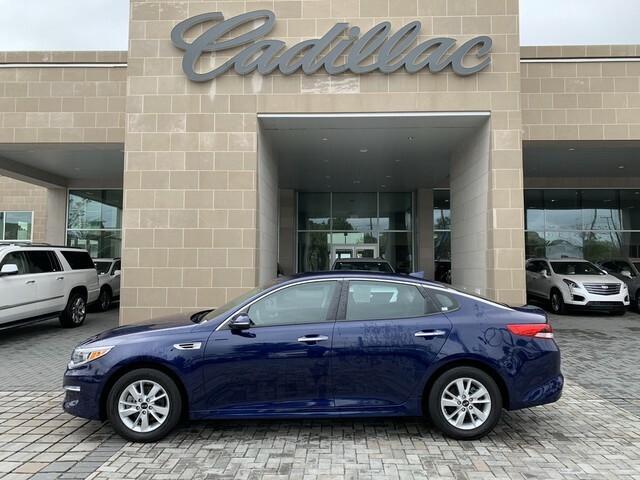 Baker Buick GMC Cadillac is honored to present a wonderful example of pure vehicle design... this 2018 Kia Optima LX only has 20,687mi on it and could potentially be the vehicle of your dreams! CARFAX BuyBack Guarantee is reassurance that any major issues with this vehicle will show on CARFAX report. The less money you spend at the pump, the more money you'll have to spend on you. So why not consider this wonderfully styled, fuel-efficient Kia Optima. This is about the time when you're saying it is too good to be true, and let us be the one's to tell you, it is absolutely true. Beautiful color combination with Horizon Blue exterior over Black interior making this the one to own!